The turn of the 20th century saw a mining boom in the east and west Kootenays. Gold and silver were the prime lures but seekers also found lead, zinc and copper. A flurry of prospecting activity brought numerous adventurers to BC’s southern interior. These years also marked a period of frantic railway building. The Candian Pacific Railway led the way with its mainline completed in 1885. This was soon supplemented by an undertaking to service BC’s boundary country since the mainline was too far north. The CPR built the Crow’s Nest Pass line, eventually reaching Midway in the west Kootenay country. The Great Northern Railroad, the northernmost USA transcontinental line, was also completed. Using its mainline the GN built secondary spurs up the north-south valleys to tap the mineral resources, bring the rich ore to the smelters in the United States, and ship products to tidewater. Since the GN ventured north into British Columbia the CPR had a formidable rival. There was another major factor at work as well, “Manifest Destiny”, the push to expand the USA north to the Arctic Ocean. A well-established annexation movement drew members and advocates on both sides of the 49th parallel. As many Americans saw it, a cruel trick of nature and boundary making had placed all the riches just across the border in Canada. This was the situation that moved the CPR directors, and in particular President Thomas Shaughnessy, to agree to a plan from the small Kettle River Valley Railway to extend the southern route from Midway. By connecting to the mainline at Hope the Kootenay resources could move to the ports of New Westminster and Vancouver. The partnership with the smaller railway (renamed the Kettle Valley Railway) meant the CPR could help tackle the economic and political challenges of southern British Columbia. In 1910, the KVR started building west from Midway, soon followed by construction from Penticton in both directions. Two daunting challenges confronted the railway and its chief engineer Andrew McCulloch. One was building through the Coquihalla Canyon, especially from Hope up to the Coquihalla Pass, where the line could be no more than the maximum 2.2% grade. The other was getting over the Okanagan Highlands which separated the West Kootenays from the Okanagan Valley, again with a maximum grade of 2.2%. McCulloch solved the first challenge with the Quintette tunnels, a unique and astounding engineering achievement, and the second with a series of long switchbacks east of Penticton, up to Chute Lake Pass and Myra Canyon. Myra Canyon itself presented another set of obstacles. It is a deep, steep and wide chasm , carved out by two main creeks (today’s KLO and Pooley creeks). To tackle these constraints McCulloch hung his railway on the sides of the canyon, using nearly seven miles (eleven kilometres) of track to reach around something less than one kilometer wide. It took 19 wooden trestles of various lengths and heights to do it. (Today’s 18 trestles come about because one was later filled in, one was by-passed, and a new one built to span a problem gulley). 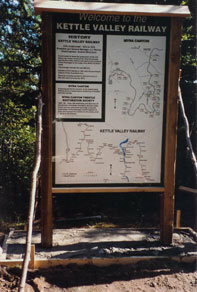 The line is at an elevation of 4100 feet (1430 metres) or 3000 feet (915 m) above Kelowna and includes the highest section on the KVR. The Myra Canyon section was completed in October 1914. McCulloch commented that he had never seen a railway built in such difficult conditions. No wonder his engineers called it McCulloch’s Wonder. . When the Coquihalla section opened in 1916 the southern route from the Kootenays to the coast was complete. For the next several decades the KVR was the major element in the economic develop;ment of the southern interior of British Columbia. For a detailed history of the construction of the Myra Canyon section of the Kettle Valley Railway, see Myra’s Men; Building the Kettle Valley Railway, Myra Canyon to Penticton, by Maurice Williams. The Carmi section of the KVR, Midway to Penticton, carried its last train in 1972. Although local enthusiasts attempted to keep the rails and use the line for tourism, in 1980 the CPR removed the rails and turned over the right-of-way to the provincial government. The trail and the trestles soon fell into disrepair. Those people who continued to use the railbed for biking and hiking faced not only the difficulty of access but danger from neglect and vandalism. When several serious accidents occurred, the government contemplated closing the site to the public. Then in 1992, the Myra Canyon Trestle Restoration Society (MCTRS) was formed with the goal of making the trestles safer for the public. Over the next three seasons, its volunteers decked each of the trestles with a four-foot boardwalk and erected guard rails. Community groups and individuals came forward to sponsor the trestles with labour, funds, or both. Everything was done through volunteers and donations. When the first work was completed in 1995, the Society turned its attention to repairing the trail, building cribbing for one of the tunnels, and arranging scaling on the rock cuts and in the two tunnels. Visitor numbers began to increase significantly. Among other things this meant the necessities of nature called for pit toilets; the Society approached BC Parks. It reluctantly provided what were called “highly experienced” toilets. Society members dug the holes, lined them with 4-foot culvert, erected the buildings and painted the outhouses. Then came the benches built by the Society and installed at view points and convenient rest points. Interpretive signage followed as did electronic counters to tally the people passing through the canyon. By 2003 the number of visitors had exceeded 30,000 per season. Local media, and especially the recreational media gave a great deal of attention to Myra Canyon. Visitors came from all over the world as the canyon became a destination for adventure tourism. A major cycling magazine in the US rated it as one of the 50 best bike rides in the world. Once the Society completed the safety features for crossing the trestles, MCTRS undertook to maintain the trail and trestle decking. Members also saw the need to protect the site. They began lobbying to have the canyon declared a provincial park. There was some interest in official circles but since the Okanagan Shuswap Land and Resource Planning table for crown lands was just being formed any new park would have to come out of that process. MCTRS became part of that planning process and eventually succeeded (after 5 years) in having Myra Canyon and its trestles declared a part of the new Myra-Bellevue provincial park. Then, to recognize the history of the Kettle Valley Railway and in particular, Myra Canyon, the Society applied to the National Historic Sites and Monuments Board for designation of the canyon as a place of national historic significance. 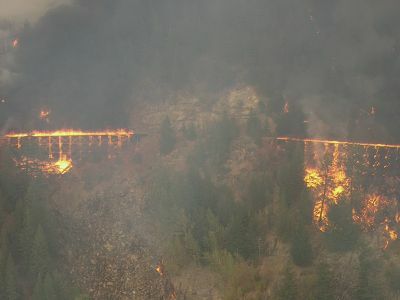 That designation occurred in January, 2003, just months before the Okanagan Park forest fires destroyed 12 of the trestles. The year 2003 was the 5th year of drought in the Okanagan Valley, making forest fires a significant danger. In mid-August a lightning strike in Okanagan Mountain Park started just such a fire. Spreading many kilometres beyond its source it burned for nearly a month. Despite huge efforts to stop the fire, it consumed more than 200 homes in Kelowna and burned over 20,000 acres of forest and parkland. In the first week of September, it reached the Myra Canyon trestles and in the next few days destroyed 12 of the 16 wooden structures and damaged the two steel bridges. In addition there was damage to the trail itself, to the rock faces and to the amenities which had been built up over the previous ten years. In the aftermath, various stakeholders formed a steering committee to assess the damage and estimate the cost of replacing the burnt trestles. The Premier of B.C. then appointed a Task Force to make recommendations to him whether to abandon the site or rebuild the trestles, and if the latter, to recommend potential strategies for funding the costs. The Task Force members included MLA Rick Thorpe, representing the province, Senator Ross Fitzpatrick, representing the federal government, Kelowna Mayor Walter Gray and Ken Campbell, past president of MCTRS. Abandonment was scarcely considered; instead the Task Force quickly recommended rebuilding the trestles. It further recommended that they be designed to resemble the original structures, both for historic reasons as well as to showcase the versatility and dependability of BC forest products. The heritage values of the trestles, as recognized by the Historic Sites and Monuments Board, were a key to the decision to replace the trestles. There were other reasons, however, namely the recreation and tourism values; but arguably the most important consideration was the extensive community involvement in the original restoration. The Task Force considered a number of funding options, including a major telethon, but in the end, found that the reconstruction costs were eligible for the Federal/Provincial Disaster Financial Assistance Agreement. This fund, based on a standing arrangement between the two levels of government, stipulates that eligible costs are shared 90% by the federal government and 10% by the province. The trestle rebuilding was placed in the hands of the Myra Canyon Reconstruction Project Management Committee comprising members of MCTRS and BC Parks. Although the plan called for the trestles to resemble the original structures, there was no need for the previous strength to carry trains. This meant a design which would only carry heavy construction equipment across the trestles to access all the construction sites. The new design meant the structures would have fewer horizontal stringers and fewer vertical legs in the bents, and in some cases, fewer bents. Before work began, a great deal of rock stabilization was undertaken to repair the damage from the heat of the fire and to safeguard the workers who would be doing the reconstruction. This alone was a substantial cost factor. Since the bridge building community in British Columbia was very interested in the project it brought old skills, new techniques, high quality work, and cost effective methods to the venture. The first trestle, number 18, was rebuilt in the fall of 2004, just one year after the fire. Five more were completed in 2005, four in 2006, three in 2007 and the final one in early 2008. Government funding was restricted to replacing the trestles plus any collateral damage directly related to the fire. Other improvement projects were (and continue to be) provided by MCTRS volunteers with donated funds. These enhancements include resurfacing the trail, installing interpretive signage, and repairing the decking and railings as needed. To formalize this work MCTRS has entered into an agreement with BC Parks to maintain the trail and the trestles from the ties up. Finally, MCTRS has added another objective to its mandate: the preservation and enhancement of the cultural heritage of Myra Canyon. For example, partnering with the University of British Columbia Okanagan the two organizations sponsored historical archaeological digs at two of the original constructions camps in 2007 and 2008. Future plans include maintaining the by-pass trail around trestle #3 (severely damaged in 2013) which follows an old tote (service) road and passes through another of the original construction camps. 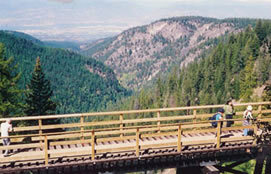 The all-important community involvement with the Myra Canyon trail continues as does its role as a crucial link in the TransCanada Trail and the Spirit of 2010 Trail.